All the big projects are done in the office & craft room except the painting of the upper walls and ceiling. That is happening today because reveal day is Wednesday! I can’t wait. I have been working on adding the last few bits of decorations and the room is really starting to come together. Since I do not have a drawer on my new closet desk, I needed a way to organize all the things I need to have handy. 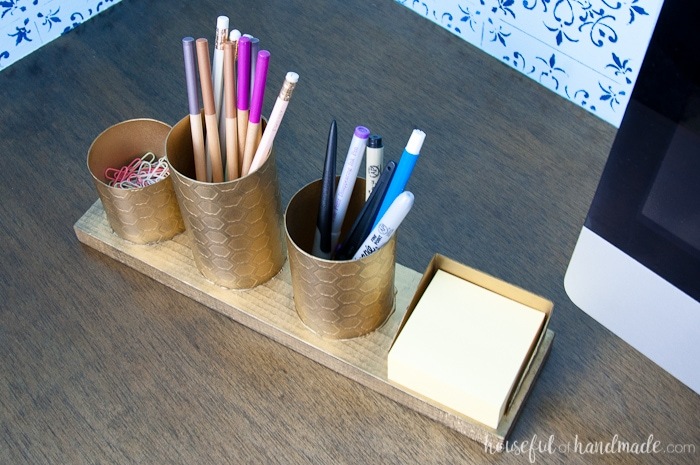 To solve that problem, I made this beautiful DIY Desk Organizer and fancied it up with a painted brass look. 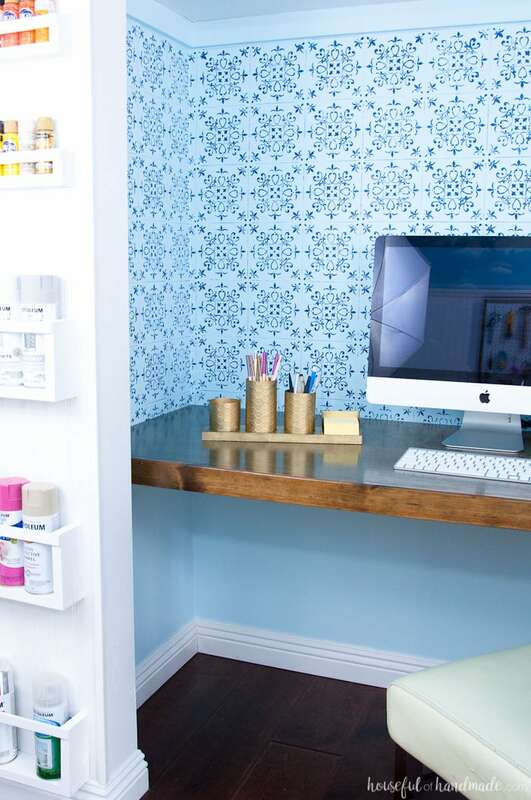 I was worried when I built my desk in the closet that I would hate not having desk drawers. I am a stickler for organization. But instead I have minimized the things that I have at my desk and do not miss it at all! It is quite nice to have this minimalist approach in the space I need to free my mind and get to work. However, there are a few things that I have to have on my desk. Obviously, a pencil is quite important. I use it to keep track of my projects and daily tasks in my planner, as well as jotting down ideas as they come to me in my sketchbook. Then there are the rest of my “tools”: a few pens, Sharpies, my fabric marking pens, x-acto knife, weeding tool, and nail file. These are the things I reach for all the time and love having on my desk. And lastly, I cannot live without my pad of Post-it notes and a gaggle of paper clips. So instead of creating a drawer area for my desk, I decided to create a beautiful DIY desk organizer to keep these important items where I need them most. I wanted to make it something that I was proud to display on my minimalist desk. Something that would be easy to move around the room as I work on my projects. And something that was cheap! I am redoing this entire room for only $100 and my money is gone. So I reached for one of my favorite mediums: paper! I have been wanting a reason to use the embossing folder I got with my Spellbinders Platinum 6 machine. I bought it because it was a chicken wire pattern and I am obsessed with chicken wire (who’s not really?). I was going to use it for some pennants on my fall mantel, but never got around to it (story of my life). 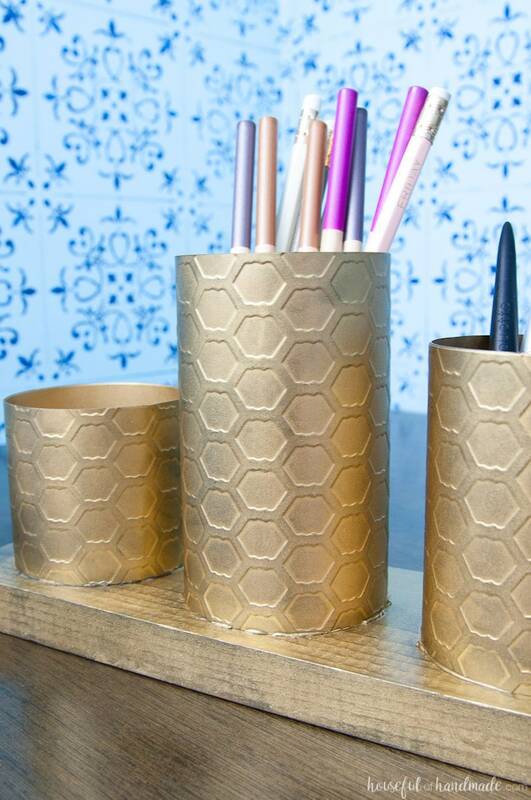 Instead, it was the perfect solution to add a little texture to my painted brass DIY desk organizer. It’s the perfect chic desk accessory with farmhouse inspiration. 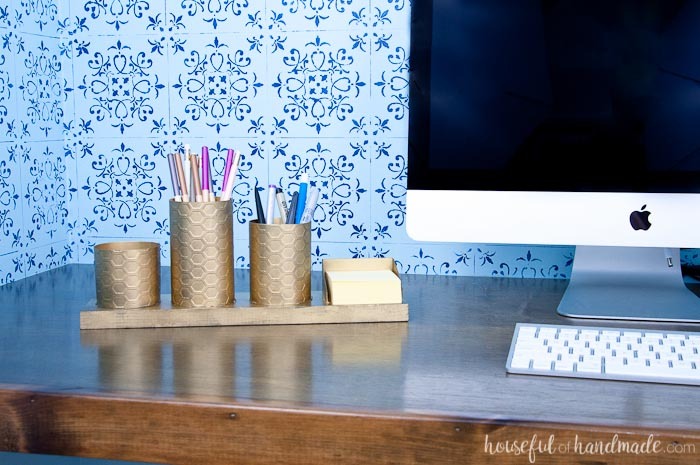 I was able to use 3 sheets of heavy cardstock and a 14″ scrap of 1×4 wood to create this DIY desk organizer. And since I could actually find all my paints thanks to these new paint storage shelves, I was able to use what I had to paint it with a brass finish. 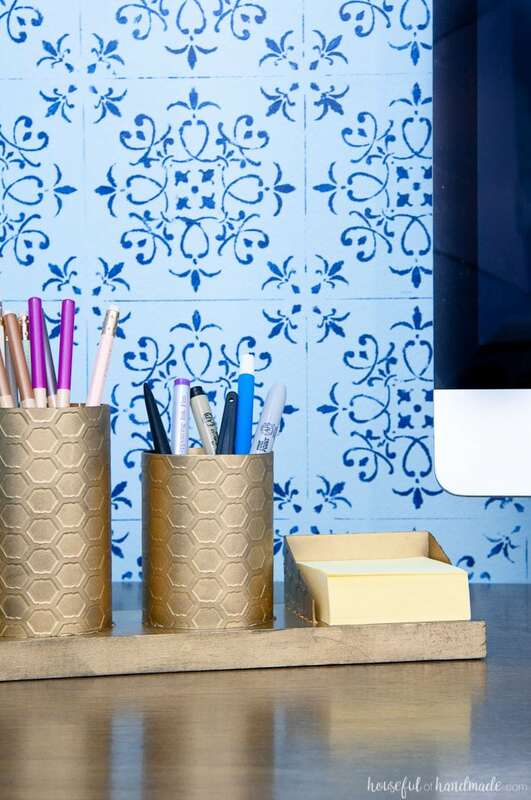 It really looks like the perfect metal desk organizer. And it is super sturdy (who would have thought)! No one will ever know it was made out of paper. 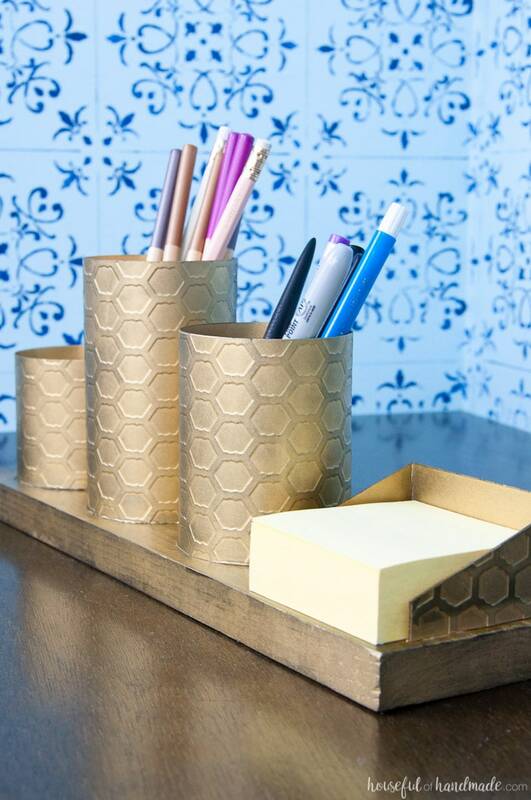 If you are ready to make your own chic DIY desk accessory, click the arrow below for the full detailed tutorial (including how I created this brass look). I think you did an A1 job! Love your color choices. Impossible not to be efficient with this redo!!!! Thanks for sharing!